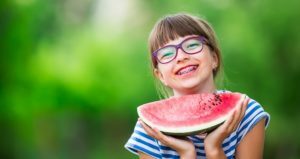 Summer is approaching, and it’s time to start planning for your child’s orthodontic care. We tend to get pretty busy in the summer months, since you want your kids to have some time to get used to braces or Invisalign aligners before school starts, so make your appointments soon! The American Orthodontics Association (AAO) recommends that a child have their first orthodontic appointment by age 7. It is unlikely that your child will need treatment at this time, but it is important to get them in early to catch potential problems early on. By being proactive and ahead of any issues, we can avoid surgery and more intensive treatment further on down the road. Many kids and teenagers are put on “observation” after their first appointment. This simply means the child isn’t in immediate need of treatment, but is being kept under close observation in order to be properly prepared for the time that treatment becomes necessary. If your child or teenager is under observation, it is important to keep up with your appointments. Despite the seemingly slow movements of teeth, things happen fast in orthodontics. Being on top of the situation is imperative when trying to avoid costly and intensive treatment in the future. Many teenagers need braces, but not all of them. If your teen does need braces it’s best to get them sooner rather than later. They may not love the idea, but in truth it’s socially acceptable as a teenager to have braces. Their friends and peers will likely be getting them as well, and there’s less of a stigma attached to teenagers with braces than there is for adults. It’s also important to note that kids have more malleable teeth and jaws to work with. They’re still growing, so it’s easier to adjust that growth to the proper specifications. Once a person stops growing, it becomes more difficult and time consuming to move their teeth around. When it comes to orthodontics, the sooner the better! Some of the most common conditions requiring orthodontics include crowding, spacing, deep bites, open bites and even under bites. Under bites aren’t very common, but they do occur and they can be corrected with orthodontics. Some teens prefer braces and others prefer Invisalign aligners. We are experts at both mediums, and it is really up to the patients and their parents to decide which is preferable. They both have their pros and cons, and it is a personal decision as to which avenue to take when it comes to orthodontic treatment. If you have a child reaching the age of 7 this year, don’t hesitate to call us! We are a 2nd generation practice, and we take care of patients of all ages. We have kids whose parents were treated here! It makes for a wonderful family atmosphere-a place where patients of all ages can feel comfortable and well cared for. We treat patients from all over the East Bay, including Pleasant Hill, Concord, Benicia, Orinda, and Walnut Creek. Call our office and schedule a free consultation today!